Sometimes a pacifier is the only way to calm a crying baby, especially when dad is up with baby at night. Now there’s good news for parents who use pacifiers. A new study in the Archives of Pediatric & Adolescent Medicine says that researchers could find no link between pacifier use and breastfeeding issues. SInce the 1980s, health officials have argued against use of pacifiers for breastfeeding moms. “Pacifiers have traditionally been thought to interfere with optimal breast feeding,” wrote the researchers at the University of Virginia School of Medicine. At the same time, researchers have shown that pacifier-sucking babies have a lower incidence of sudden infant death syndrome (or SIDS). The American Academy of Pediatrics now recommends that pacifiers be used for sleeping babies to lower the risk of SIDS. This advice has long been in conflict with the parallel need to encourage healthy breastfeeding. In the study, researchers looked at 29 studies in 12 countries that had examined the role of pacifiers and breastfeeding. 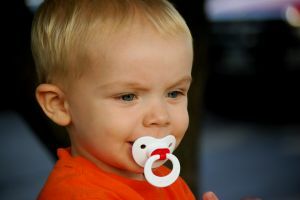 Dr. Fern Hauck, the senior author of the study, recommends that parents start the pacifier at three to four weeks old.